The Aerospace industry is able to operate at such a high level of efficiency and safety primarily because of its internal operating procedures which includes their engaging the highest quality suppliers for their parts. These parts must be of the highest standards and have the strictest tolerances. Suppliers meet these needs by utilizing manufacturing tools like the Omax Waterjet which can consistently create the most exacting parts for aircraft. The Aerospace industry is one that is built on precision and accuracy. Aerospace companies design, test, and manufacture military, civilian, and shipping aircrafts and have little room for inaccuracy because their being inaccurate can cause death and injury. At any given moment there are literally thousands of aircraft flying over the skies of every country on the planet. Governments millions of people and tens of thousands of companies depend on the expertise of Aerospace companies to help them successfully move things from one place to another quickly and safely. What is a Waterjet Cutter? A water jet cutter, also known as a waterjet, uses a high-pressure jet of water or a mixture of water and abrasive materials to cut a large variety of variety of materials including textiles, rubber, foam, plastics, leather, composites, stone, tile, glass, metals, food, and paper. For softer materials, using high pressure water is sufficient. However for harder materials including metals and stone, companies will utilize abrasive jets to cut. 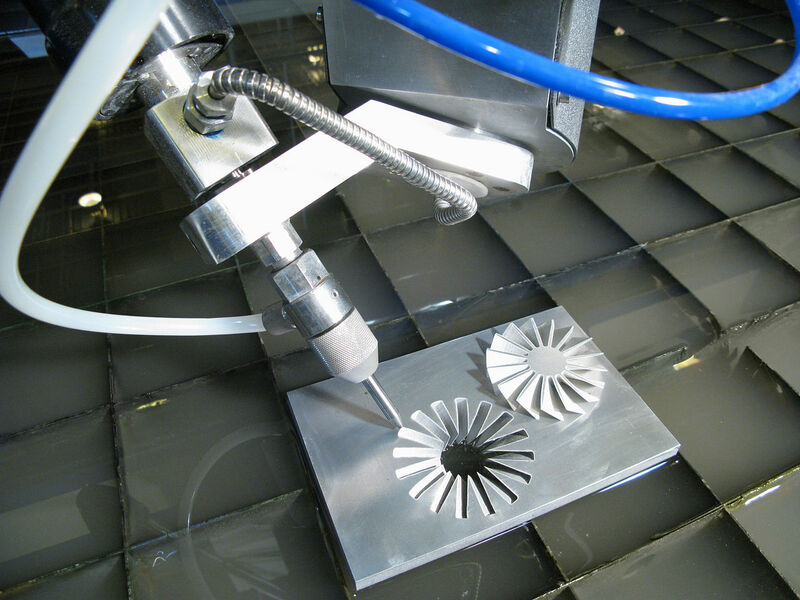 Waterjet cutting is the perfect solution for cutting materials that are sensitive to the high temperatures that cutting with lasers and other methods, produce. When industries like mining, construction and aerospace, for cutting, shaping, and reaming need things cut that are temperature sensitive, their first choice is a waterjet. These machines have been traditionally very expensive because of their level of sophistication and accuracy. But technology in these machines is constantly evolving and today there are manufacturers creating very high quality machines at lower prices. For example, Dr. John Cheung, and Dr. John Olsen have focused on taking the current technology used in waterjets to a new level of precision and affordability. Today, their two product lines, OMAX and MAXIEM Waterjet Machining Systems are unlike anything else on the market. These abrasive waterjet machines feature innovative motion control technology and utilize proprietary software that sets a new standard in the marketplace. It used to be that when a company looked to purchase a waterjet they had to choose between cost and accuracy, but with the OMAX and MAXIEM machines, the need for gaining one benefit at the expense of the other has been eliminated. The company is an innovation leader that continuously introduce new technology for an ever-evolving industry. As aircrafts continue to become more and more sophisticated, the need for highly parts like those created by the OMAX and MAXIEM waterjet machines will increase. The company will be sure to meet industry needs in the future, as it does today.